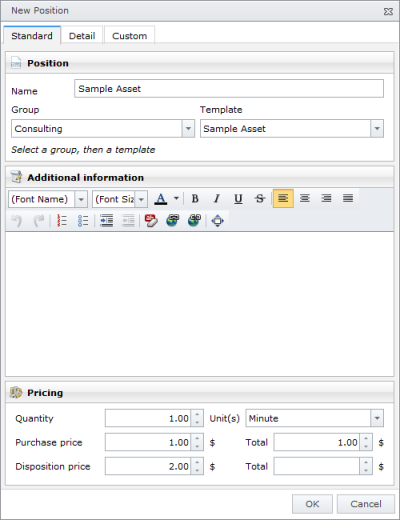 In the project, in the Start tab, in the Sections group, click Budgets. In the Additional information area you can add the important information on this position. In the Total fields you can see now the position amount ("Price per unit multiplied by quantity"). Click Performed by to add a person's name, which creates this budget position document. Send an email message about the new created budget position. Click email icon right to the Performed by field. For more information see Select project team members, in a Send an email message section. Only for the position of the budget types actual expenses or planned expenses. This is set automatically once the position (or the entire document) has been billed. Only for the positions of the budget types actual expenses or planned expenses. The positions with this status are not included in the actual revenues. For more information on how to add a new custom field in the InLoox PM Web App see Create custom fields. How to add and edit budget positions in InLoox PM 7 Web App • Copyright 1999-2019 © InLoox GmbH. Tous droits réservés.